MRT tires (www.motoracetire.com) were a contributing factor to winning for Sean Haluch Racing as they took 1st place in the Ultra4 East Coast Series opening at the Anthracite Outdoor Adventure Area (AOAA) in Coal Township, PA.
With this East Coast Series opener, UTV was well-represented with a field of 22 teams. Among those were the Sean Haluch Racing drivers: Michael Lee, Chris Armstrong, Erik Jokinen, Brian Stone and Sean Haluch who were all running MRT “Race” series tires. Sean Haluch was the first UTV on course for qualifying and set a blistering pace in rough terrain and inclement weather conditions. Starting second on course, Sean was able to make up the 30 second staggered start within the first few miles. After passing for the lead following the first major rock section, the Sean Haluch Racing turbo opened up a solid lead leaving the field in the dust. This course had 2 major rock sections, several hill climb areas, as well as a few fast “fire road” runs. Mud and water were also very abundant throughout the race due to a late season snow storm. After the first couple laps, many teams suffered flat tires cut on the jagged coal mining terrain, but the 32” MRT “Race” series tires held up strong on the SHR rzr. Sean held a solid 4-minute lead on the next competitor coming into the 4th lap. At the top of the first rock section, Dave Cole of Ultra4 alerted Sean to the time limit approaching and the fact that this may be the last lap. With that news it was ‘game-on’, no more conserving fuel, time to let the MRTs eat! Finishing almost a full 7 minutes in front of second, only 2 machines finished on the lead lap. 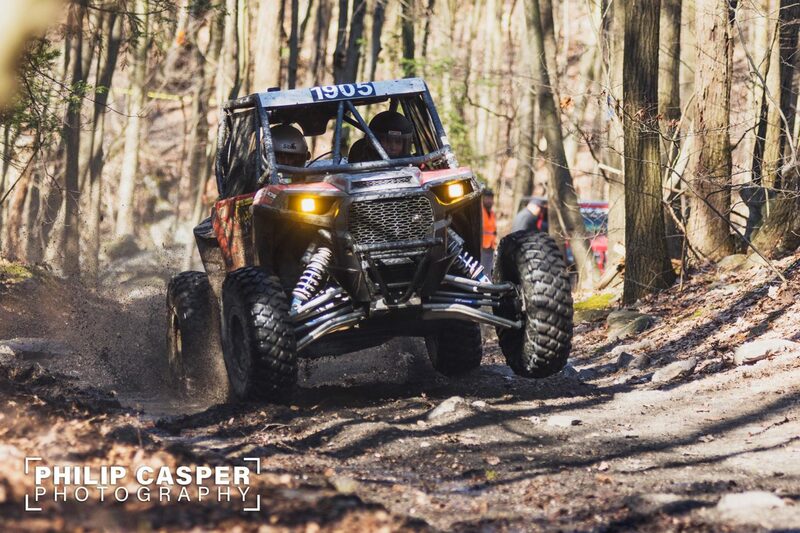 MRT tires were a contributing factor to this winning scenario with their Kevlar Armor Belt tires that have proved their quality by standing up to extreme racing terrain and weather conditions. During the post-race in-care interview, co-driver Mark Shea stated “MRT tires gave us another finish with no flats!” At the award ceremony, driver Sean Haluch acknowledged MRT’s commitment to quality. “We had zero flats, the MRT tires were absolutely great – I can’t believe what we pound them through!” according to Haluch. The Sean Haluch Racing team has been successfully running MRT tires for more than 2 years and this is the second time on the podium in as many races with the Ultra4 Racing East Coast Series, finishing second to fellow MRT racer Darian Gomez last year in Kentucky. They are also back-to-back UTV Champions in the Line Mountain race series that co-ran this event. MRT Kevlar Armor Belt tires are proven to be the highest anti-puncture strength tire. This allows the drivers the confidence to tackle tough terrains and weather conditions. “Our motto ‘Quality When You Need It’ is proven on these courses. We achieve excellence by testing, failure analysis and continuous innovation. MRT tires pass the strictest of tests and scrutiny before they are released. It’s this focus that allows drivers to race with confidence. We also accredit the Kevlar Armor Belt as the strongest best traction UTV tires on the market. And our continued innovation ensures our tires are always able to succeed through the toughest challenges” according to Mark Thornburg, president MRT. Endurance Race @ Oklahoma Gold Rush, Hallett Motor Racing Circuit, NORRA 1000: 2017 Podium, 2018 Champion, and many more! MRT, MotoRaceTire.com, is the leader in delivering the highest quality and most innovative tires on the market today. Working closely with race teams and mechanical CAD aided testing, MRT continuously develops new leading tire technology including the first and only Kevlar Race Tire using Kevlar Armor Belt. These tires are lightweight and designed to provide run flat protection combined with strength and speed on the track. MRT Kevlar Armor Belt quality is designed and built to outlast the competition. Guaranteed and backed by MRT’s Continuous Improvement Warranty program. MRT teams test in ALL race conditions, and tires components are modified based on driver’s feedback and tire performance. This attention to detail and drive for continuous improvement is why MRT provides the best race tire now and will continue to provide the best tire for all race and riding conditions.